The counts in the provinces were posted by the king, as representatives of central authority. They had judicial, military, financial and other executive authorities. Groups of several counts were governed by dukes. All of them were Frankish aristocrats, who were given an estate, and thus a share of its profits. Due to often marauding excursions into Frankish territory, Merovingians themselves fought wars with Saxons. Having finished the war with Langobards, Charles invaded Saxons, with whom the wars had lasted from 774 to 80415, with a few temporary shutdowns. About the Saxons, Einhard wrote: „No war ever undertaken by the Frank nation was carried on with such persistence and bitterness, or cost so much labor, because the Saxons, like almost all the tribes of Germany, were a fierce people, given to the worship of devils, and hostile to our religion, and did not consider it dishonorable to transgress and violate all law, human and divine.“ […] „It is hard to say how often they were conquered, and, humbly submitting to the King, promised to do what was enjoined upon them, without hesitation the required hostages, gave and received the officers sent them from the King. They were sometimes so much weakened and reduced that they promised to renounce the worship of devils, and to adopt Christianity, but they were no less ready to violate these terms than prompt to accept them, so that it is impossible to tell which came easier to them to do; scarcely a year passed from the beginning of the war without such changes on their part.“16 At the end, Charles depopulates them, and they mix with Franks and together start to form a single nation. After short encounters with Bretons and Beneventines, which were solved quickly, Charles attacks Bavaria. Its duke, Tasilon, started ruling rather independently, what Charles disapproved of. Once Charles and his army arrived to the river Lecha, he sets an encampment on the banks, and sends for the duke to declare his intentions. It was then declared that this county will not be run by a duke anymore, but rather by several counts. After this, Charles led a war against the Slavs, who were defeated instantly. Later on, he engaged the most important of his campaigns (apart from the one with the Saxons), the war with Avars. 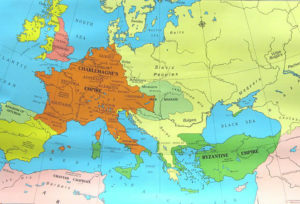 Following the conquest of Bavaria, Avars became direct neighbors to the Franks on the eastern border. The war lasted from 791 to 796, and again from 799 to 803. Einhard states that there was no blood shed on the Frankish side in this war, and that it yielded a very favourable outcome.17 In one of his campaigns against the Avars, the Franks occupied their metropolis, the so-called Ring, in which Avars kept their loot from many campaigns. Einhard says that the pope had suddenly, without expectation, put the crown on Charles’ head and that Charles at first had such an aversion that he declared that he would not have set foot in the Church the day that they [the imperial titles] were conferred, although it was a great feast-day, if he could have foreseen the design of the Pope. EINHARD, Život Karla Velikog, Zagreb, 1992. 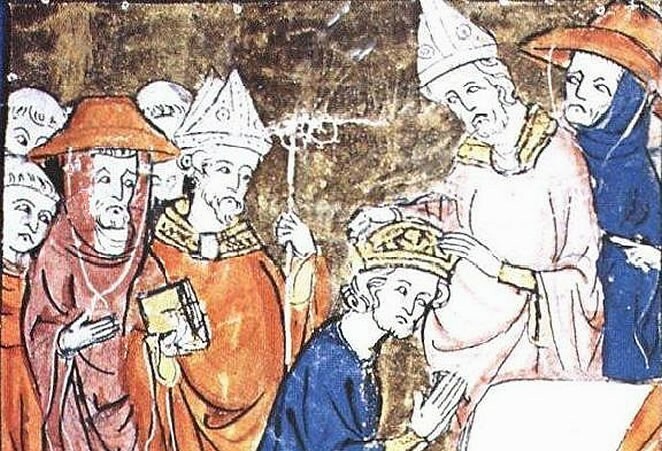 Note: Articles about Charlemagne, are made on the basis of his biography written by his contemporary, Einhard. For a better understanding of the subject, we used a foreword by I. Goldstein. Articles relies on the text in the Croatian edition. Therefore to expand the topic, we recommend that work. 1 EINHARD, Život Karla Velikog, Zagreb, 1992., 114. 2 EINHARD (note no. 1), 114. 3 MELITA TOMAŠEVIĆ (ur. ), Povijest svijeta, Split 2005., 304. 4 EINHARD (note no. 1), str. 115. 6 MELITA TOMAŠEVIĆ (note no. 3), 305.-306. 7 EINHARD (note no. 1), 57. 8 EINHARD (note no. 11), 12. 9 Compare EINHARD (note no. 1), 13. 10 Compare EINHARD (note no. 1), 13. 11 Compare EINHARD (note no. 1), 13. 12 EINHARD (note no. 1), 11. 13 EINHARD (note no. 1), 11. 14 EINHARD (note no. 1), 61. 15 EINHARD (note no. 1), 122. 16 EINHARD (note no. 1), 63.-65. 17 EINHARD (note no. 1), 73. 18 EINHARD (note no. 1), 74.-75. 19 EINHARD (note no. 1), 124.